The Artz Pedregal shopping mall stands partially collapsed on the south side of Mexico City, Thursday, July 12, 2018. A newly opened shopping mall on Mexico City's south side partly collapsed Thursday after structural problems apparently led the mall's operators to evacuate the area, and no injuries were reported. Videos posted on social media show a cantilevered, multi-story section of the mall collapsing in a cloud of dust and twisted metal on Thursday. Some of it fell into lanes of a major freeway, which had been closed shortly before the collapse. The Artz Pedregal mall opened in March, though parts remain under construction. It had drawn the ire of neighbors worried about the loss of open space, congestion and other issues. Built on the edge of the city's main expressway, the mall had suffered previous subsoil slides. 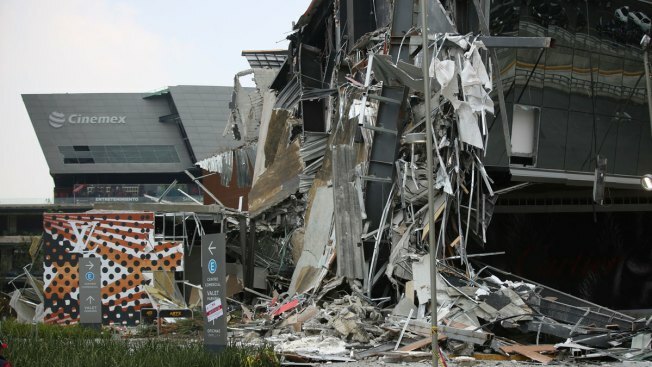 Mexico City Mayor Jose Ramon Amieva said the collapse occurred in an area of offices, and experts were investigating whether the collapse of the cantilevered area was due to structural defects or soil settling. "They noticed that a separation was occurring," between the overhang and the rest of the building, Amieva said of the hours before the collapse. In a statement, the mall's operator said that it notified city authorities when it noticed signs the area was collapsing. It said it regretted the impact the accident was having on traffic on the notoriously crowded Periferico expressway. At least two lanes were closed. The mall was controversial in part because it threatened to clog traffic, and because it was built near a rain catchment basin that serves to regulate the city's seasonally heavy rainfall. The risk posed by substandard building has been a longstanding issue in Mexico City, where many poorly built or designed buildings collapsed in the city's 1985 and 2017 earthquakes, both of which occurred on Sept. 19. In 2016, while foundation work was still being done on the mall, a retaining wall next to the expressway partly collapsed.